For interactive data preparation, try Turbo Prep. For automated machine learning, try Auto Model. For a hands-on introduction to the user interface, read about the Design View. 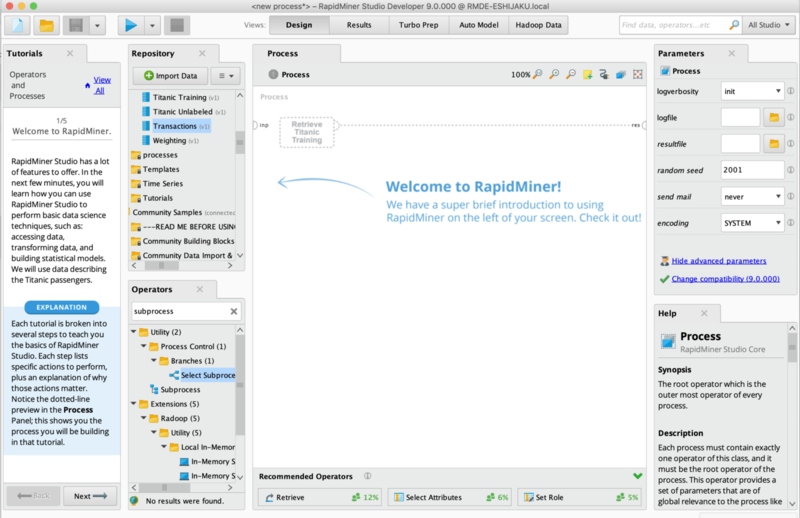 For training videos, check out RapidMiner Academy. For basic data science tutorials, see the series 5 minutes with Ingo. For a review of data science terminology, see the Getting Started Glossary. For help, best practices, and networking, visit the RapidMiner Community. 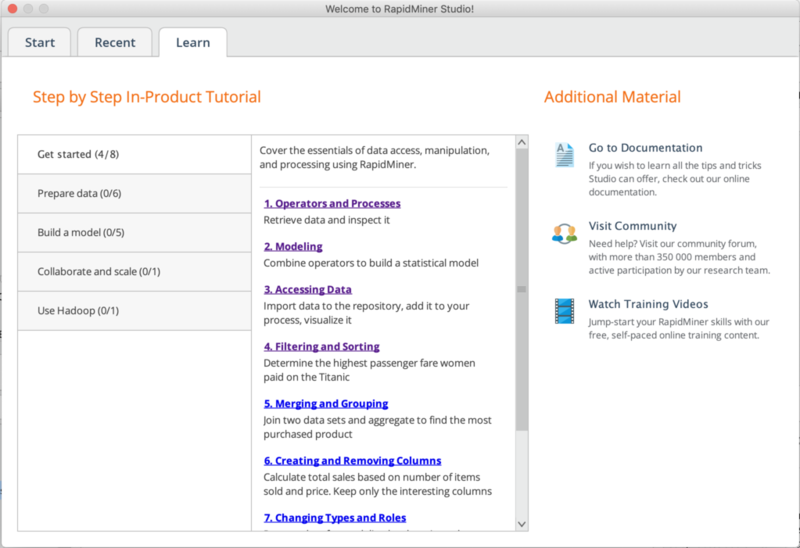 Step-by-step tutorials are activated the first time you open RapidMiner Studio. It's a good idea to read the introduction and take the guided tour. Later, you can reopen the tutorials by selecting File > New Process, and choosing the Learn tab. 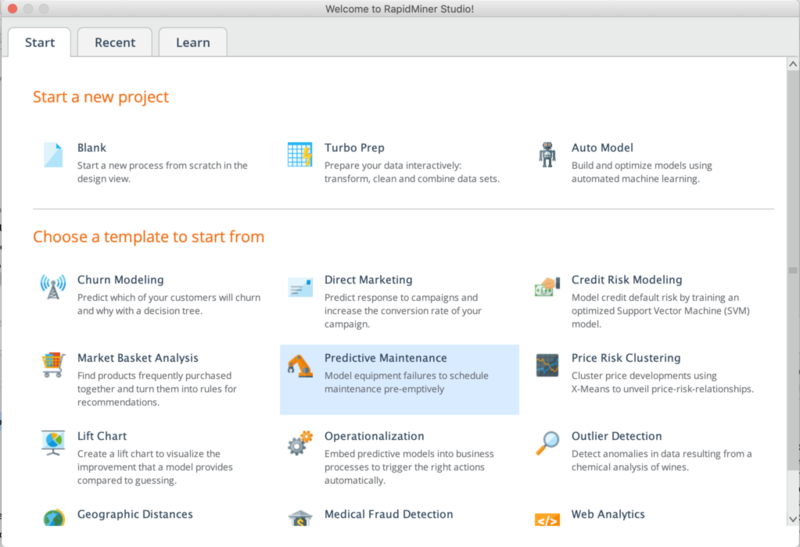 If you want additional guidance, or you want to accelerate your data preparation and model building, try Turbo Prep, RapidMiner's tool for interactive data preparation, and Auto Model, RapidMiner's solution for automated machine learning. If you want to see more examples, choose from one of the templates in the Samples Repository. If you want to do it yourself, create a new (blank) process from scratch in the Design View. You can open the Start Page at any time by selecting File > New Process.